This is an animated cartoon that was released inside the game Pokémon Channel. A half-hour long anime show, broken into five short segments, featuring the Pichu Brothers. 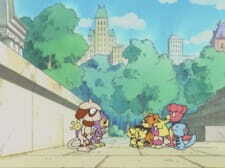 Meowth throws a party that the Pichu brothers and their friends are not invited to. After a series of events, they find out they were invited, but their invitations were simply delivered late. They go to Meowth's Party and hear him sing. The series has a total of five episodes, each on its own channel. 100% of the reason for me writing this review is because there isn't one on here yet. Well maybe 99, with 1% being that I've never made a MAL review before. Being that I don't even use ratings on my list anymore I wouldn't take any of the numbers seriously aside from enjoyment I suppose, but once again numbers are just odd to me so whatever. If someone makes a genuine review of this I'll take mine down no problem, just thought I'd give my thoughts. Anyway for those who don't know, Pokemon: Pichu Bros. in Party Panic is a half hour special episode broken into 5 mini segments that can be achieved and watched on the video game Pokemon Channel for the GameCube. Being that I owned a GameCube as a kid as well as Pokemon Channel, I'm of the probably very few people who has actually watched this. If my memory doesn't escape me, the episodes had to be unlocked and when you got all 5 you could watch them together in a row as a complete episode on the game, and that was just super cool to me as a child. As far as the episode goes, it's your pretty standard Pokemon special but charming nonetheless. The Pichu Bros and their friends weren't invited to Meowth's party, and they more or less make it their goal to get in (Or at least find out why). They get into some interesting shenanigans, I don't wanna spoil it but some Pokemon such as Houndoom and the Squirtle bros make an appearance. Quite the cute little episode to watch in a video game. If I recall correctly, segment 5 is done entirely in the video games CG, kinda reminiscent of Pokemon XD: Gale of Darkness if you remember that game. I don't know if they run on the same engine, but I thought that was interesting. Segment 5 being the music video where Meowth Sings of course. Overall, if you've watched Pokemon or specifically any short Pokemon specials in your life you know what to expect here, aside from the CG segment of course. If you've ever played Pokemon Channel and you watched this episode on there please tell me you felt as cool as I did as a kid because I just thought that was the future right there lol. I do know I had fun with this short as a kid, knowing what you're getting into you'll probably have a fun time too.